With my vertical engine nearly finished and largely painted I'm shortly ready to start building another steam engine and want to make a relatively big horizontal. 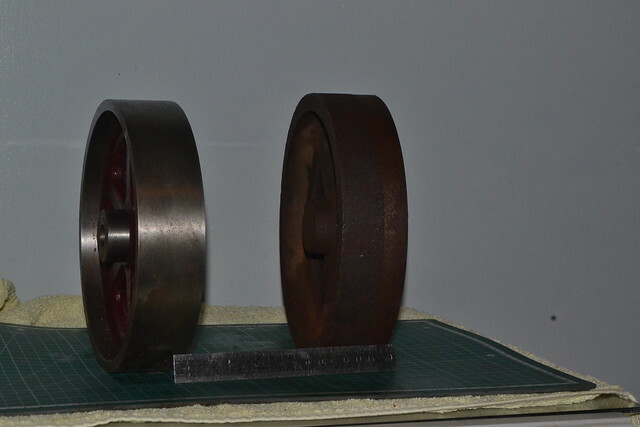 I've managed to get a pair of chunky looking flywheels of about 8" dia x 2" wide. They ought to be big enough but I'd like just a bit larger diameter so just kinda thinking aloud at this stage, do you think it would be practical to turn an additional steel sleeve to give say 3/4" extra diameter? I thought possibly heat shrinking or Loctite 638 would give a secure fit to then turn the entire wheel and hopefully get rid of the join marks. Re: Adding diameter to flywheels. What you are suggesting Peter is entirely feasible but I personally I wouldn't use either methods - heating shrinking, if it cools too quickly before the rim is fully home could leave you with a major problem and like wise with Loctite. The kind of fit required over that diameter could easily jam before the rim is home and you have the same issue. Thanks Tug that's something I hadn't thought of. At the moment I'm kinda thinking ahead a bit and still trying to work out the overall design of the engine. I was looking at perhaps just over 2" bore and about 3.5" stroke - (dimensions are very flexible as long as its a decent size). The flywheels I have are nice and chunky at 2" wide but ideally I think a slightly thicker rim would look more in proportion. Where are you going to get the disc to add to them? It is highly likely that the new metal will be a different colour to the original so the join will always show unless you paint the sides of the flywheel. Those are already bigger than the flywheels fitted to my No 5A engine. I think any thicker rim will spoil the look. They appear to be similar the the 8" ones RDG used to sell at a very reasonable price which I have used a couple of times. 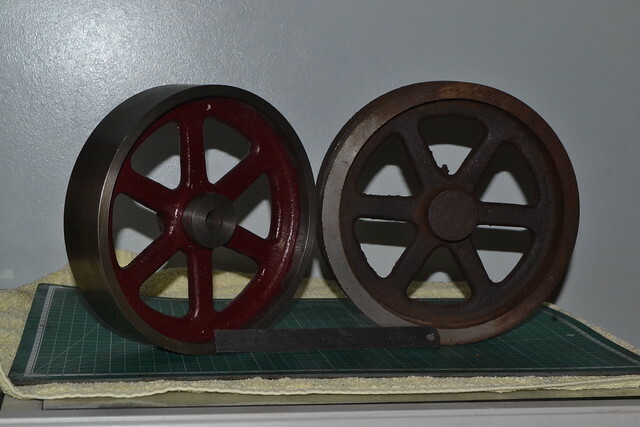 If you want a bit more rotating mass then get a bigger flywheel (Engineers Emporium have several) or use a disc style crank and a reasonably sized take off pulley. If you do want to add to it then thick wall steel tube would be simplest but you could get a disc of cast iron sawn and stitch drill out the middle to save turning it all to swarf. I'll take another look at Eng Emp but last time I looked months ago I couldn't find what I wanted. Jo, as a matter of interest how big are the 5a wheels? I want and engine of a similar capacity but with possibly a longer stroke. 7 1/2" Diameter and 1 1/2" wide.